FLORA, Mississippi – Primos Hunting, a leading innovator of game calls and hunting accessories, gives elk hunters even more advantage over lovesick bulls with the new On The Double elk call. The call’s double open reed design produces simultaneous sounds of two estrous cow elk competing for the herd bull’s affection. As if that weren’t enough enticement to bring any red-blooded bull within earshot on a run, the call’s ingenious dual reed configuration also allows hunters to mimic multiple cows and calves with a virtually endless range of mews and other vocalizations. 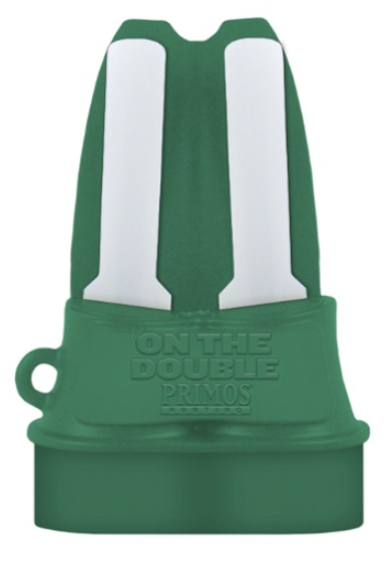 Like all Primos’ products, the On The Double elk call was developed by the company’s industry leading team of hard-hunting, veteran callers. The durable call is also remarkably easy to use. With just a little practice, even novice callers can quickly and accurately replicate a variety of cow and calf communications to bring trophy bulls into range.